Exactly one month ago we took a look at Super Toy Cars, a game in the same genre as the subject of this early morning's review, Table Top Racing for the PlayStation Vita. It's my pleasure to say that Table Top Racing fares a bit better than what we covered last month. Here's the review. play with these awesome virtual toy cars instead! 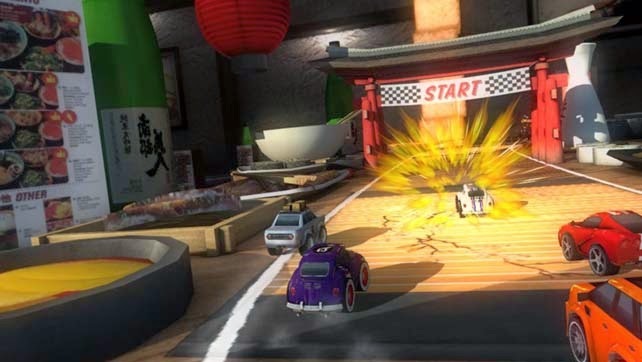 Table Top Racing originally debuted on iOS devices last year, and it brought with it an abundance of free Micro Machines-style racing. 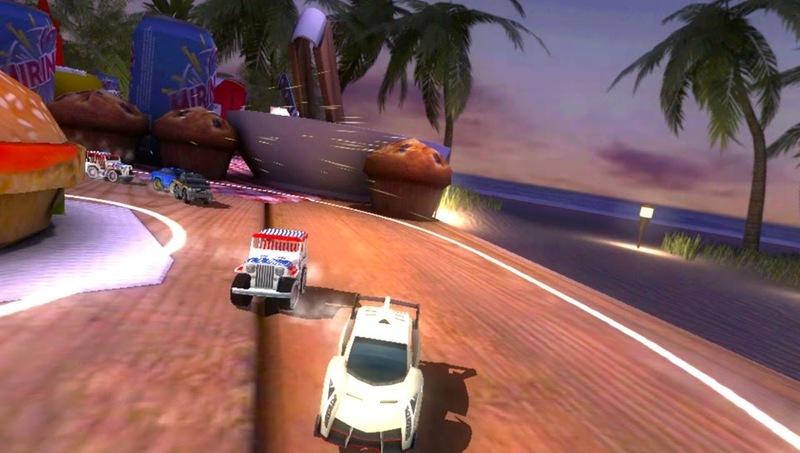 An Android version was released earlier this year, and now Table Top Racing has revved its miniature engines and rolled onto a dedicated gaming device for the first time in the form of the PlayStation Vita. Hearing that the game is from the co-creators of the insanely addicting and polished Wipeout series makes for big expectations for an otherwise decidedly unassuming racer. Is Table Top Racing worth a look on Sony's handheld, or would Vita owners better be served playing with their old set of Hot Wheels cars? It seems that plenty of developers grew up playing with toy cars and raced with them much like I did as a kid. How do I come to that conclusion? Simply because miniature cars racing in a video game seems to be an idea that's a dime a dozen. However, Table Top Racing doesn't just make this fun, it also executes the idea splendidly-- and without the tears that come from having your mom accidentally step on one of your favorite toys. I LOVED THAT RETRO FORD MUSTANG, MOM!!! ...Ahem. Ooh. Save some of that miso for me! Anyway, when I say Table Top Racing executes the idea well, I'm talking about how tightly and responsive each small scale vehicle handles and feels. The starting ice cream van controls well enough, even with its modest stats, and when you move on to more awesome rides, racing become even better. Seeing how easy it is to pick up and play the game and how little there is to learn to start racing with the best of them, it makes racing on top of picnic tables, kitchen counters, and even barbecue grills exhilarating. Yes, exhilarating. Of course, simply racing through courses lined with everyday household and outdoor objects would grow tiring rather quickly, so like any capable and competent racer of this style, items are involved. From EMP shocks and homing missiles to mines and nitro boosts, Table Top Racing has a handful of helpful items that keeps races interesting. Not only can they help you fend off opposing racers wishing to take first place away from you, but they also assist in keeping up with the pack. Though, it's important to note that the latter isn't really hard to do, as the overall difficulty of Table Top Racing is on the low end of the spectrum, save for some later races. there's a whole bottle of oil right to the side! Something that also has a low difficulty is coming across a questionable design choice regarding the controls. The rear view of Table Top Racing is activated by grazing the back touch pad of the Vita system. Since the touch pad takes up so much real estate on the Vita, it makes accidentally switching to a rear camera view all too easy mid-race on multiple occasions. This results in a lot of accidental crashes into objects and missed turns due to being unable to see them, a problem that is particularly vexing if you have large hands. This means you must hold the Vita in an awkward position just to avoid routinely touching the rear pad. 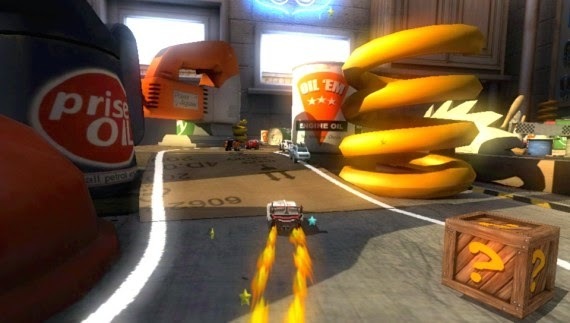 The main mode of Table Top Racing consists of several championships featuring a plethora of race types. There's traditional races with no items, combat races with items, time trials, elimination-style races, and a chase race where you try to catch up and ram into the CPU driver as fast as possible. Perfecting each event will take a good while to do, as will getting all of the trophies. Thus, Table Top Racing certainly has plenty of longevity to it. at night. Wait. I've never been to Miami! Completing races not only furthers your progress, but it also bestows you with coins. Unlocking cars and upgrades for your hot set of wheels are done through spending coins. Due to the mobile gaming roots of Table Top Racing, you can go about purchasing coins with real world money in order to unlock new cars and upgrades on a swifter basis, if you so choose to go down that road. Just realize that this route is by no means necessary to unlock everything within the game. This trucka is a bad mutha-- watch your mouth! 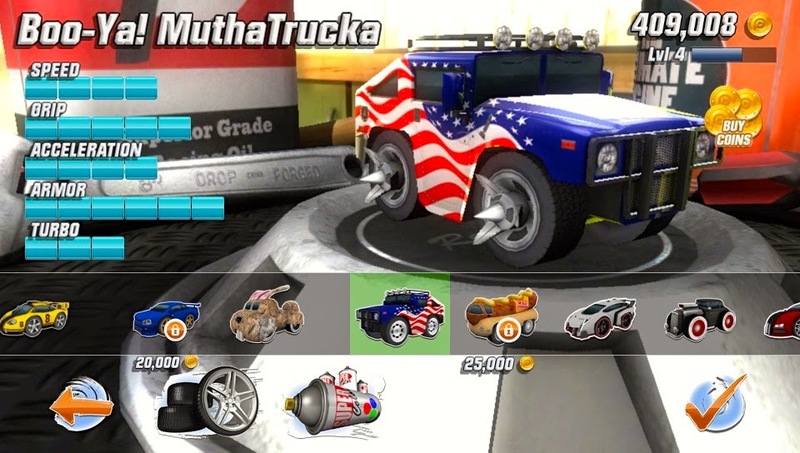 Regardless, a myriad amount of vehicle types are available to buy, each with their own stats that can be upgraded, paint jobs to purchase, and special abilities to unlock like being able to bunny hop over obstacles to create makeshift shortcuts, for instance. Table Top Racing was a bit of a looker on iOS and Android, but on the PlayStation Vita, where there's plenty of downloadable games that are downright jaw-dropping, the visuals do less than impress. Textures in the game do little to excite, many objects that line the track look like they are made out of plastic (which would be fine if those hot dogs were meant to actually be doggy chew toys), and the overall look of the game comes off as cheap. However, the vehicle models and backgrounds are of a high quality. It's also worth mentioning how vehicles leave behind tread-marks, which is neat to see, so it's not all bad visually. On the audio side, if you're a fan of ho-hum rock music that is bundled together with even more ho-hum rock music, then Table Top Racing will make your ears love you for giving them a chance to experience the music of the game. Nonetheless, the majority of players will probably mute the game, especially since the sound effects don't do much to interest the listener either. Table Top Racing is one of the better miniature car racers out there. It controls well, has wonderful racing action, a lovely helping of content, and it's easier to play on the bus or train to work than hauling your collection of Micro Machines and playing with them there. Plus you won't get as many dehumanizing, judgmental stares. The game has its fair share of issues, but those wanting some fun toy car action will find plenty of enjoyment with Table Top Racing.